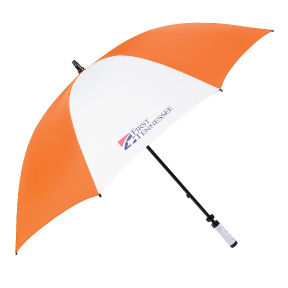 Looking for an umbrella with superior construction and large enough to accommodate two people? With flexible durable fiberglass shaft and ribs and a plastic ID handle, this umbrella will last a long time. Size: 60″ arc, 49″ dia. ; (closed) 37-1/2″l. Available in black or navy, alternating – red/gray, navy/white. royal/white, evergreen/white, black/white, hunter/white, orange/white, purple/white, Caroline blue/white, orange/navy, gold/navy, gold/black. Min is 36 at 14.50 ea, 72 at 13.38 and 144 or more at 12.43. Price includes one color/one location logo (no set up for first color/location) in imprint area is 10″ w x 8″ h. Second color imprint or location set up is 31.25 with an add’l charge of 1.25 per item. Item #B25003.